Melange of Natural Rock Salt for Saltair consists of Middle Miocene halite rock salt, enriched with magnesium. Magnesium is known to help in relaxing the smooth muscles in the respiratory system. It is recommended to be used in acute conditions or flare-up of a chronic condition. It comes in 8 oz container, about 250g. One container will last for about 6 months of recommended use. Please note that Saltair device has to be used only with our provided rock salt for the 1 year warranty to be in effect. Using a different salt will void the warranty, as the device's lifetime can be affected negatively! Also, we do not guarantee same health results using a different kind of salt! 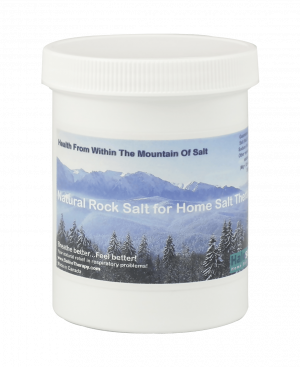 Natural rock salt is the best option for your health, as it was formed long ago when there was no pollution and it is also rich in natural occuring minerals. Note: We recommend to add at least one salt container when you purchase a Saltair unit to save later on from shipping cost.